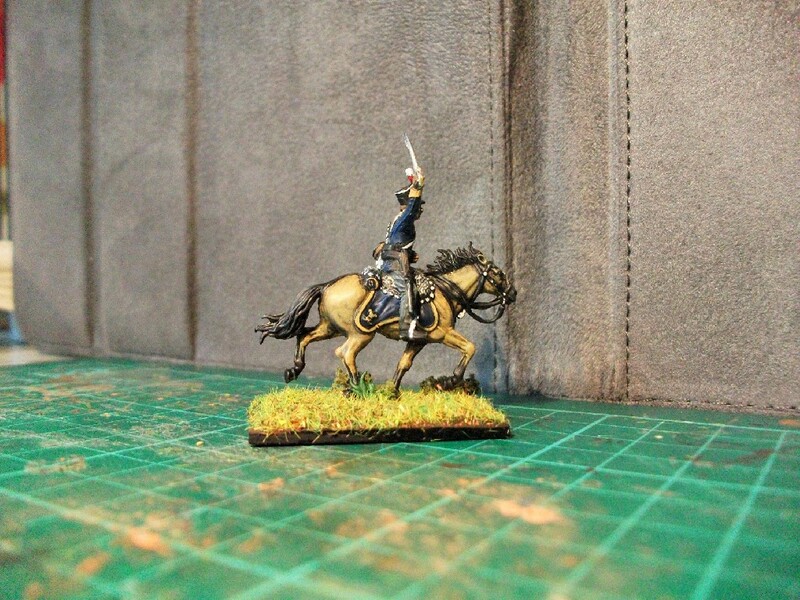 It’s been a couple of months since I last turned my brush to the Warwickshire Yeomanry. But now I’ve come back to them again and this week I’ve turned my attention to the first couple of horses. These light dragoon horses come with saddlecloths, sabretaches and carbines; none of these seem to be features of early yeomanry cavalry. So I’m having to make compromises again. I’ve left off the carbines and sabretaches, but here’s not much I can do about the saddlecloths so I’ve just painted them with colours of my choosing, light blue for the saddlecloth with green ‘wolf teeth’ to match their facings. Meanwhile, I’ve other plans! Some new figures have come through the post in recent weeks: in 1/72 scale there are some HaT colonial Indian infantry and HaT Bengal Lancers; and from Perry Miniatures some 28mm British infantry from the 1st Carlist War (1833-1840). And there’s more news too. I’m busy painting something else…but I can’t actually tell you about it! In fact, for reasons I can’t reveal, I’ll be keeping it a secret for a few months yet! Well, after some weeks developing these figures (alongside the 4th Dutch LD), It’s nice to see them finally see the light of day. I do like these uniforms with their unfussy green double-breasted jacket. These early HaT figures are a little stiffly posed, as I’ve said before, but with the application of paint, they are reasonably impressive. This set came with the option of adding a rolled greatcoat tied over their shoulder. Initially, I was keen to add them to this regiment but I found that one of the poses restricted its addition and so I left them out as I wasn’t sure it would ultimately work all that well. Enough said. 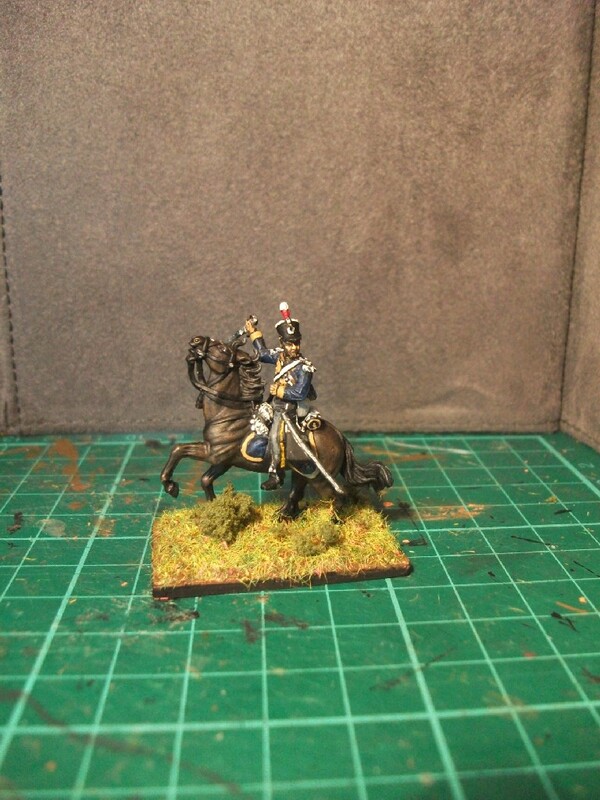 It’s the 17th regiment in my Nappy Cavalry Project, so you know the drill by now; bring on with the photos and biography! 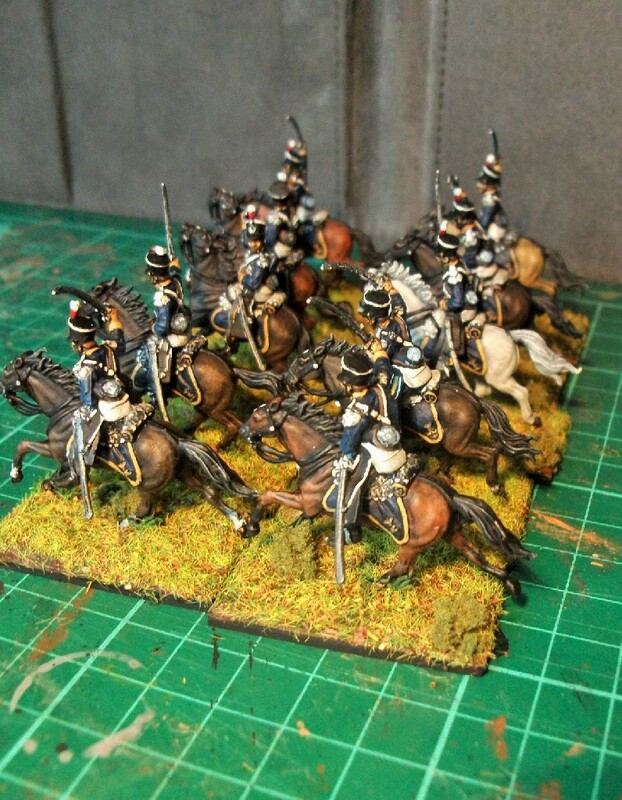 At first glance, the 5th Belgian Light Dragoons, in their green uniforms, look a little like French chasseurs a cheval and indeed this would cause some real problems for the regiment during the Waterloo campaign. In the Anglo-allied army, the 5th were brigaded with the Dutch 6th Hussars in van Merlen’s 2nd Light Brigade. At Quatre Bras, the regiment charged at a vital moment to cover the withdrawal of Dutch-Belgian infantry and in so doing took very heavy casualties, losing 170. This was its first encounter with what were, prior to Napoleon’s abdication, their former allies. Indeed, Merlen their brigade commander had been an adversary of the British in Spain, fighting for the French. Furthermore, a Lieutenant Dubois of the 5th had a father who was a French general. It was whilst engaged in a prolonged melee with the 6th Chassuers a Cheval at Quatre Bras that the French and Belgian cavalry called out to each other. The French cavalry indicated by their downturned sabres their peaceful intentions, encouraging the Belgians to rejoin the French colours. Merlen’s bellicose response was to launch a charge at them! Unfortunately, the regiment then suffered further by being shot at by British troops whilst retiring (their green uniforms looking much like the enemy’s). Similar confusion occured later, Highlanders stood to arms when a returning Belgian dragoon vedette answered a challenge in French! Although mauled, the regiment still fought at Waterloo, now down to only 271 sabres. In particular, it counterattacked the French cavalry penetrating between the Allied squares. Van Merlen was unfortunately killed and the 5th Dragoons lost 157, but the regiment had performed magnificently. 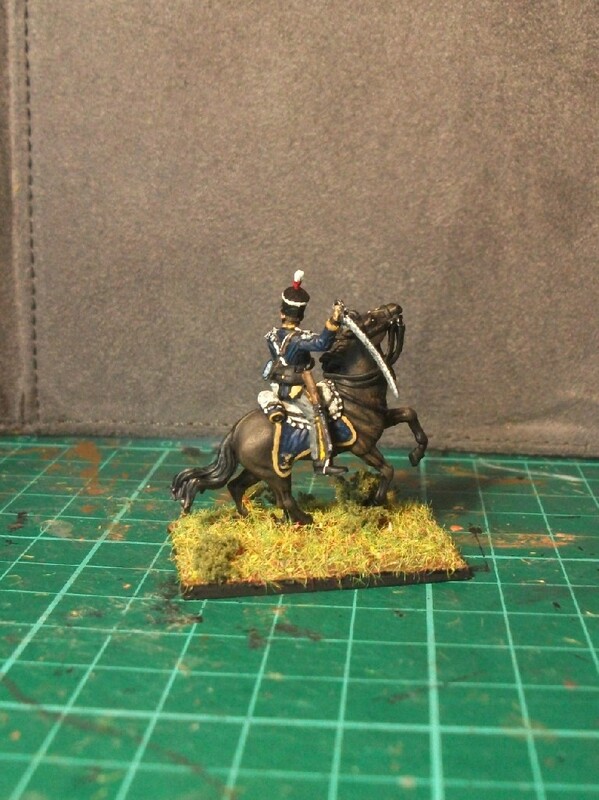 If I thought that the Nappy Cavalry project was going to end in 2015, I was wrong; I just can’t stop painting Napoleonic cavalry! 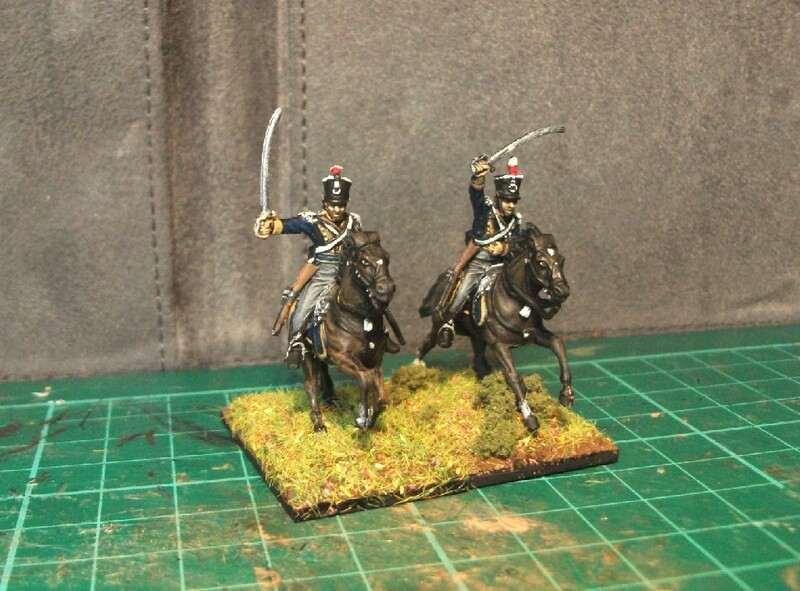 For the past few weeks I’ve been working on two boxes of HaT Dutch-Belgian Light Dragoons, making for a total of 24 figures split evenly between the 4th Dutch and the 5th Belgian Light Dragoon regiments. This set comes with a separate head for the officers (who wore a differently shaped shako to the other ranks). Attaching this head meant moving dangerously into “conversion” territory, something which I usually shy away from. Nevertheless, I had a go. After decapitating an ordinary trooper, I soon realised that I might need to ‘pin’ the new head on. Following some trial an error with a hot needle, I finally succeeded in forcing the pin into the figures neck and head. It’s not what I’d call a professional conversion, but I think it looks okay and at least the head is less likely to fall off. 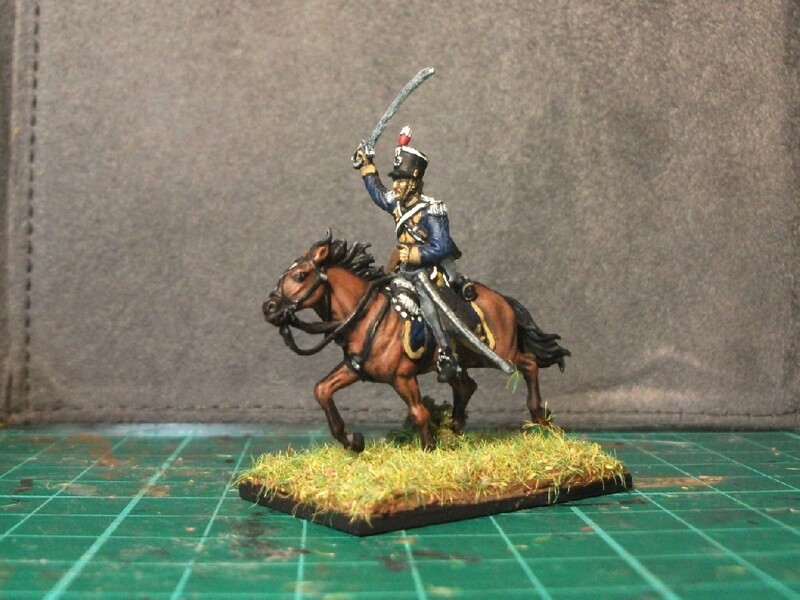 The 4th Dutch Light Dragoons look a lot like hussars with all that braiding on their jackets, though they have no pelisse over their shoulders. HaT’s figures aren’t the most detailed or crisply sculpted, and the poses on this old set aren’t particularly dynamic. Yet, there’s still something quite pleasing about the figures now that the paints on and the varnish is dry. Here are some pics (and a brief regimental history) of the finished 4th Dutch regiment, I’ll be posting images of the 5th Belgian version very soon! 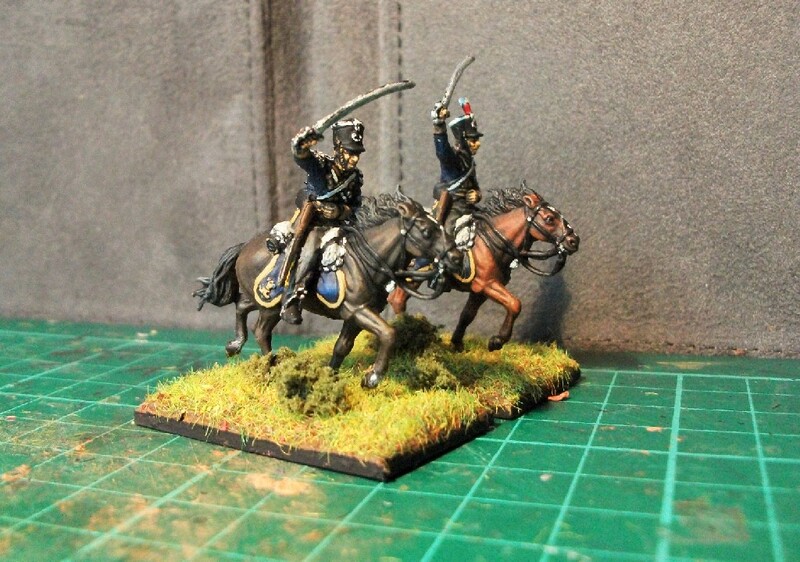 Biography: 4th Dutch Light Dragoons during the Waterloo Campaign. During the Waterloo campaign, the 4th Dutch Light Dragoons formed a part of the 1st Netherlands Light Cavalry Brigade alongside the 8th Belgian Hussars (part of the Netherlands Cavalry Division under Lt-General Baron de Collaert). As with nearly all the Anglo-Allied light dragoons, they wore blue coats and this might have helped them avoid any significant ‘friendly fire’ incidents as afflicted the 5th Belgian Light Dragoons in green coats. Having four squadrons of 647sabres, it was the largest light dragoon regiment in the entire Anglo-allied army. They were initially deployed towards the centre rear of the line. Their brigade commander, Major-General Baron de Ghigny had previously faught for the French, gaining considerable experience under the French colours during the Napoleonic wars. Nevertheless, under his leadership, the 4th LD would prove themselves redoutable opponents to Napoleon on the 18th June 1815. As the afternoon developed, the 4th were to find themselves increasingly heavily engaged against the French cavalry. Initially, they advanced against French lancers to assist in the withdrawal of the Union Brigade. Later in the afternoon, they continued to counterattack repeated incursions of French cavalry which penetrated between the infantry squares. Their commander, Lt-Col Renno was wounded and the regiment suffered around 38% casualties. Both regiments were heavily engaged at Waterloo under Wellington. 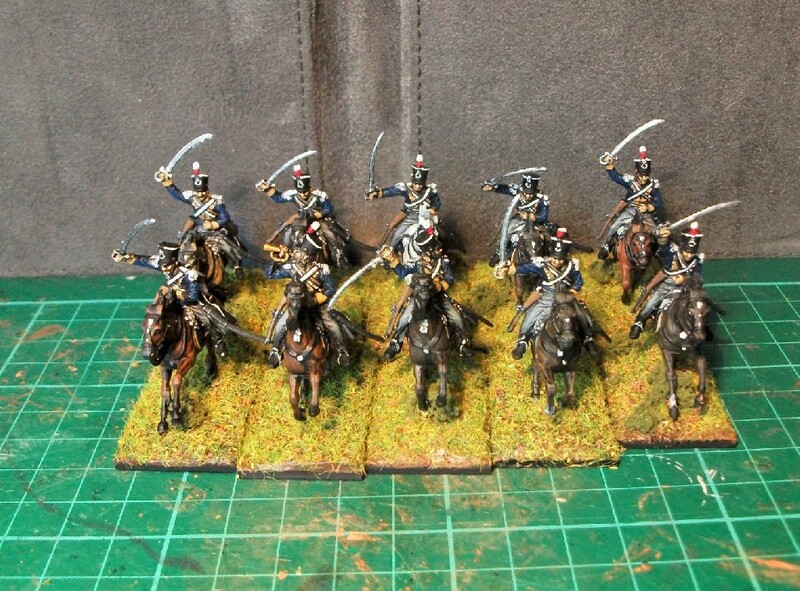 I intend to add them, when eventually complete, to the Nappy Cavalry Project page along with all the other Napoleonic regiments featured there from 2015. Being early HaT sets, the figures on the sprue look competent rather than brilliant. Yet again, however, I’ve been impressed how well they come up after the application of paint. I’ll soon see how their horses fare after I begin to tackle those next. I’ve found an excellent little article on the prints drawn by a local “stationer and painter” Edward Rudge. He drew images of various Birmingham volunteers during the time of the threat of invasion by France at the end of the 18th century. Two of his prints show two local infantry volunteer units; the Birmingham Loyal Association and the 1st Battalion of the Royal Warwickshire Regiment. The third print, dated April 1801, depicts my very own Warwickshire Yeomanry Cavalry in “what seems to be the second uniform of the regiment, with a skirted ‘Austrian’ jacket”. This refers to the jacket extending a little below the waist (which mine do not as the sculpter). The print shows two mounted troopers fully engaged in sword drill and is “respectfully dedicated by their obedient humble servant, E. Rudge.” A highly detailed version of the aquatint print can be found here at the Brown digital repository. Meanwhile, figures which will form my contribution to the Bennos Figures Forum Group Build for 2016 have now finally found their way to me through the post, so I may have to put the yeomanry horses on the back-burner until these have been painted. Anyway, more on this soon until then here’s pics of the WYC troopers which are now nearing completion. They still require their scabbards and sabretaches attaching, and their stirrups painting, but they are 90% finished. I’m pleased with how they’ve turned out and are, I like to think, an improvement on my first 28mm figures painted earlier this year. 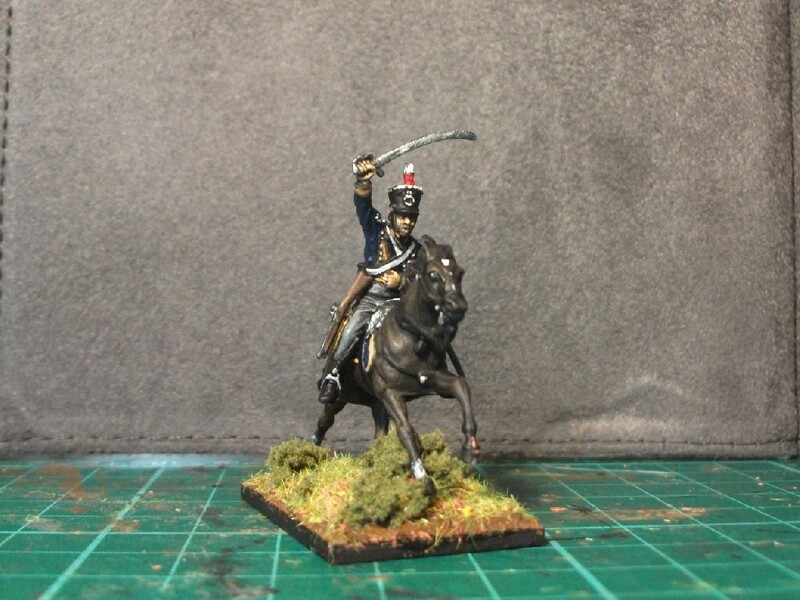 The first of my progress reports on the Warwickshire Yeomanry Cavalry project. As you can see, the ‘French Grey’ coats worn by the regiment has been applied I’ve used Vallejo’s Grey Blue which I had lying around from painting French Poilu’s in gasmasks from the First World War. After the basecoat was on, I felt it was a pretty good match for what I wanted. 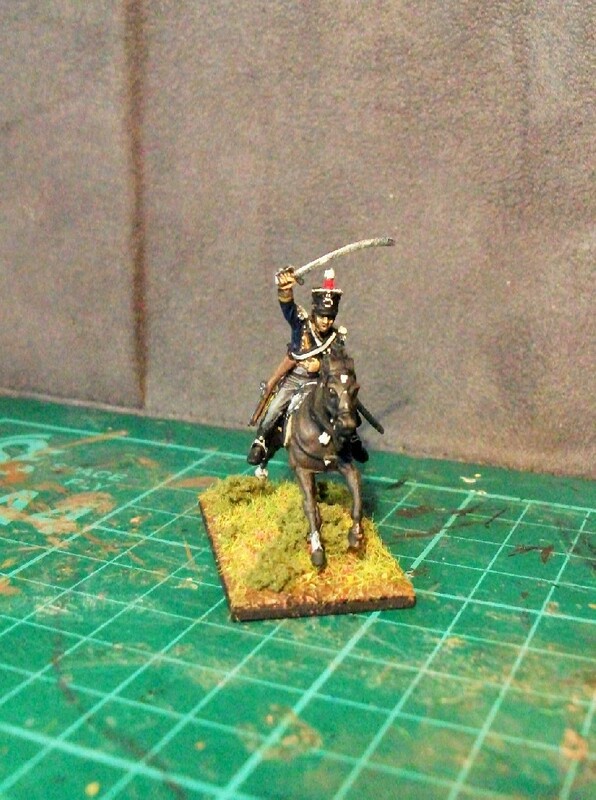 The breeches have simply been basecoated and still require a little shading. They will be wearing gloves which will be white (the contemporary painting below of an officer shows him holding a pair of white gloves). Inevitably, there will have to be some compromises in the depiction of the uniform. The coats apparently extended below the waist belt. Although I could try to paint this in, I’m always inclined to work with the sculpter and so have just painted down to the waist belt. The WYC also seemingly had brass epaulettes, but these are absent on the Perry figures; I may attempt to paint these in. Finally, the horses shown in the few prints of the regiment seem to have no saddle cloth. But, I’m not too concerned. Detailed information on the WYC is scarce and what sources are available is probably best treated with caution as regards accuracy. Consequently, my depiction of the uniform will probably be as good as any! Now that my Royal Artillery battery from the 1860s has been finished and gone to take their place in my display cabinets, it’s time to turn my attention to a new challenge. Alongside the Royal Artillery figures, another Christmas/birthday present that I received in December was Perry Miniatures Napoleonic British Light Dragoons set. 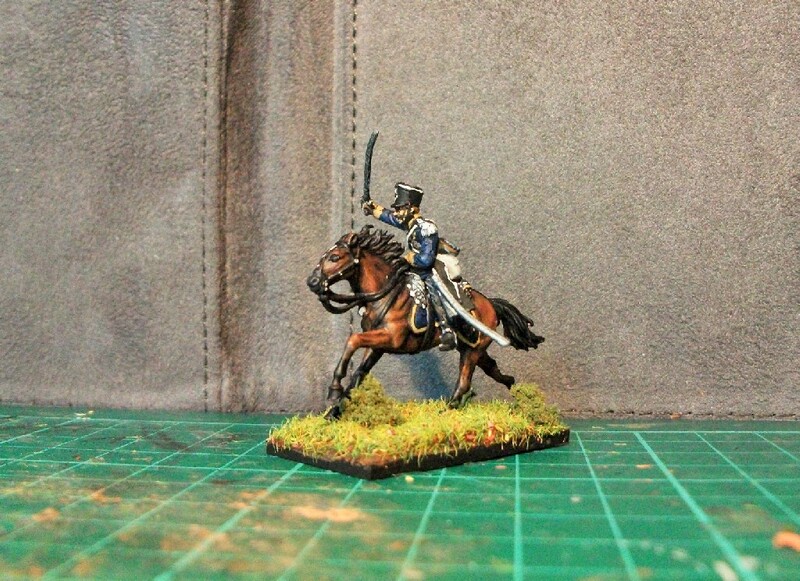 They are also the larger 28mm scale and come with a choice of creating either early or late versions of the uniform (there’s even an interim version available with a Heavy Dragoon style helmet). The two uniforms were radically different and, having painted the later version at 1/72 scale last year, I’ve opted to go for the earlier version which features hussar style braiding, breeches and boots, and the crested tarleton helmet. In the past couple years, I’ve visited a number of military museums that have featured displays on local yeomanry forces. Yeomanry, being essentially volunteer cavalry intended strictly for homeland service, were first raised in response to the growing threat by revolutionary France. 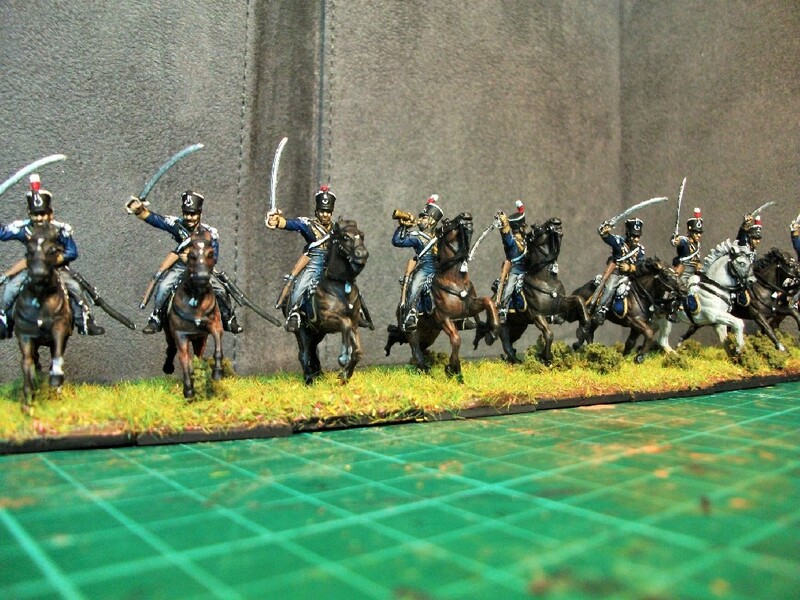 Around this time, they were dressed in very similar uniforms to the regular light cavalry, so this set also offers the possibility of painting a yeomanry regiment. The question is: which one? The uniform I’m planning to paint is light blue in the centre. A couple of years ago I had planned to visit the Warwickshire Yeomanry Museum in Warwick; the pleasant little town having no less than three military collections within walking distance of each other. Unfortunately, being staffed by volunteers, the day I had rashly arranged to go coincided with a closure. I was cheeky, however, and contacted one of the trustees, a Mr Philip Wilson, who most generously agreed to open up and show me round for the afternoon. When we met, it transpired that we were both long-time members of the Victorian Military Society. The personal tour was terrific and I could not have asked for a kinder or more knowledgable guide. Whilst there, I purchased a couple of books on the Warwickshire Yeomanry and these are going to form the basis of my guide to painting their early regimental uniform, an example of which can be seen below. So, in respectful tribute to Mr Wilson and the Warwickshire Yeomanry Museum’s generosity, these will be the next Suburban Militarism painting project*. I proudly introduce a British cavalry regiment: the 13th Light Dragoons! 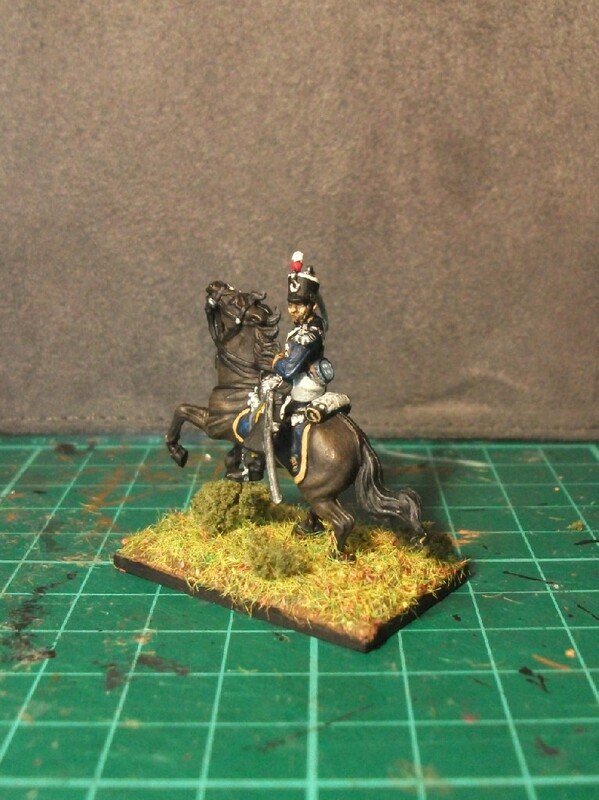 Yes, I’ve finally completed the third offering in my 2015 Napoleonic cavalry project. 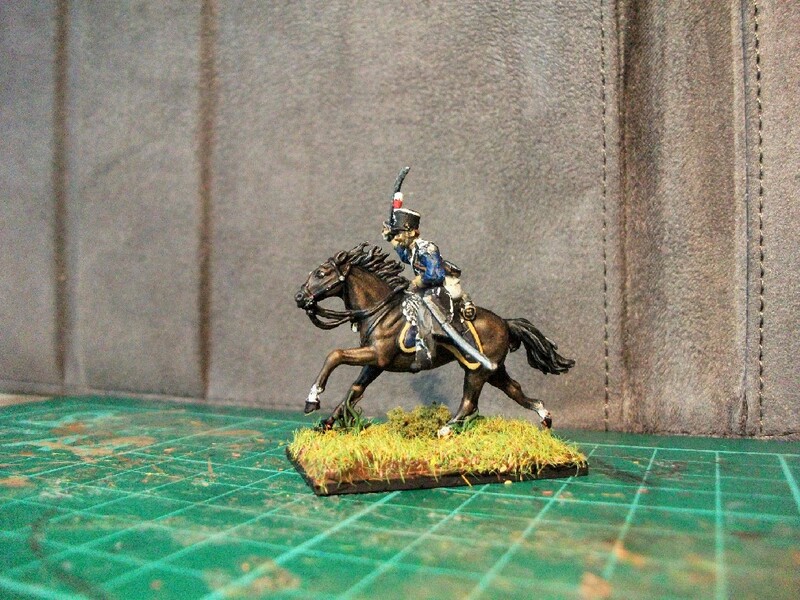 They’ve been a good few weeks in development because I got distracted by the wonderful Chasseurs a Cheval. It’s another Italeri offering, and the sculpted figures are of their usual very high standard. They don’t quite have the elegance of the French hussars but have real energy and character, nonetheless. Like the Chasseurs a Cheval, the figures ‘didn’t fit perfectly’ on the horses, but generous glue application just about did the trick. Light dragoons before 1812 wore a dark blue, braided, dolman jacket and a leather Tarleton helmet with a bearskin crest. After the uniform changes of 1812, all light dragoons wore dark blue jackets with short tails and a bell-topped shako, as depicted in these figures. I’ve previously written a detailed post on the history of the 13th Light Dragoons so, aside from the now usual regimental ‘biography’ below, more detail on the regiment can be found there. Formed in 1715 initially as heavy dragoons, the regiment was led by Colonel Richard Munden. They took part in the suppression of the 1745 rebellion and the battle of Prestonpans. After time in Ireland, they were redesignated Light Dragoons and served in the Caribbean before being recalled as the threat of French invasion grew. Sent to the Peninsular in 1810, their campaign started with the capture of a party of French Dragoons at Ladoera. At Campo Mayor in 1811, the 13th LD famously charged and routed a significantly superior French cavalry force. Despite their very great success, the Duke of Wellington received a inadequate report of the action and severely reprimanded the 13th (calling them “a rabble”!) for their excessive pursuit. He seems to have eventually relented and recognised his error some time afterwards. They faught many actions in the campaign, especially the battles of Busaco, Albuhera, Orthez and Vittoria, prior to the invasion of France and battle of Toulouse. At Waterloo, they numbered 455 sabres and formed part of Grant’s 5th Cavalry Brigade having been detached from the 7th. The 13th LD was commanded by by Lt-Colonel Boyse (who replaced Lt-Colonel Patrick Doherty – ill in Brussels with ‘West Indies fever’). Boyse was wounded in the battle and also replaced by a Major Lawrence. In total, the 13th Light Dragoons at Waterloo suffered 111 casualties (24%), mostly incurred in their repeated actions against the French cavalry. Battle Honours: Albuhera, Vittoria, Orthes, Toulouse, Peninsula and Waterloo.